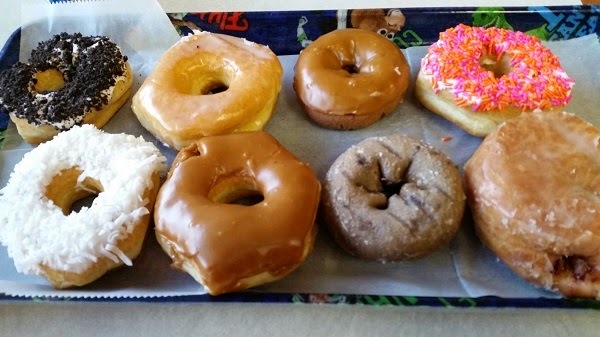 Gibson’s Donuts, Memphis TN (take two) – Marie, Let's Eat! Here’s a very short little post for you today, readers. The last time we were in Memphis, we stopped by Gibson’s Donuts on our way out of town, with a light and gentle rain beginning to fall, and I took terrible photos, and we sped out of there as quickly as possible for what would be the beginning of a really, really long and exhausting drive home though a monsoon. With a flat tire. This time, I wanted to try a little harder and capture the fun place, which opened in 1967, a little better. Gibson’s is a really upbeat and very busy place for breakfasts and snacks. 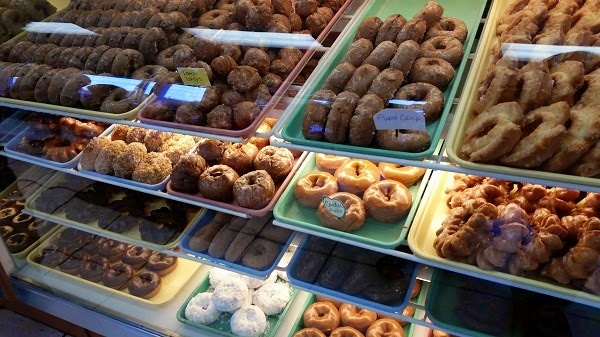 Since the overwhelming majority of their visitors seem to grab ‘n go, the staff is even more pleased to welcome people who are “staying to eat with us,” and they bring by some of their “buttermilk drops,” little extra doughnut holes, after you’ve eaten a bite or two of your breakfast. The owner or manager was, for a white-haired older fellow, moving with the speed and enthusiasm of a preschooler in a toy store. 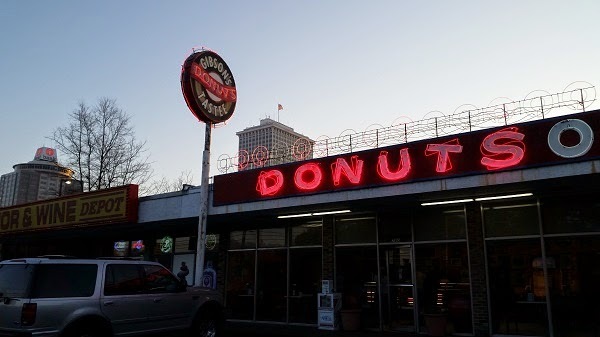 I mentioned that we had to have some doughnuts before we left town, and he asked where we were headin’, at which point another gentleman came in and they greeted each other with smiles and roars, he saw that his order was filled, and then he told us, “You see this man? He owns the best Italian restaurant in Memphis, and you definitely need to eat there next time you come to see us!” And then there were sixty-eleven more people to greet and serve, and sixty-ten more people rushing out the doors with coffee. As the other guest made his speedy departure and our host vanished behind a tidal wave of customers and I munched on my blueberry doughnut, which might be the best blueberry doughnut that I’ve ever eaten, I wondered what the name of that Italian restaurant might be, for the next time. Posted on April 26, 2015 August 21, 2017 by Grant G.Posted in breakfast, memphis, tennesseeTagged breakfast, doughnuts, memphis, tennessee. So why don’t ya call ’em back and ask? You can’t just forget that kind of intro…. I only mentioned it in the context of how crazy it was. 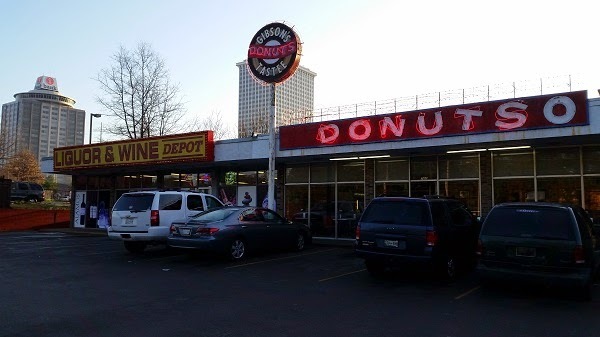 Our Memphis to-do list is already long enough to fill the next three trips to visit Marie’s sister.